Will Reality Bite for the Low Information Voter? I have to admit that I hope it does; I hope that reality bites with no ambiguity, leaves nothing to their imaginations and forces them to see the folly of their vote. We all know one, or two…okay, scads of ’em; the friends or co-workers who voted for Obama with a blind confidence that was as tedious as it was frustrating. The cubicle mates who unblushingly proclaimed that they get their “news” from Jon Stewart, Stephen Colbert and Bill Maher, dutifully regurgitated the previous night’s hilarity with sycophantic smugness. 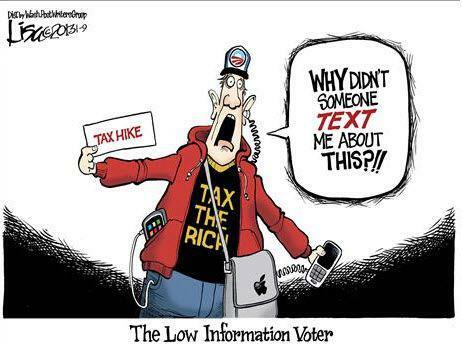 We all know Low Information Voters and now that 2013’s first paychecks are being cut and direct deposit’s are hitting bank accounts, the LIV is getting a small peek at what is to come. Will a slap in the face from reality finally wake them up…my gut says no. The hard cold reality is slowly setting in…or is it?